Create multi-purpose spaces - Since a Murphy bed easily folds into a framing system attached to the wall, you’ll have extra area for a home office, craft room, living room or workout space when the bed is not being used for sleeping. Your guest bedroom can become a place you use year-round. More comfortable than a futon or couch bed – If you’ve ever slept on a thin futon or sofa bed you know it can be painful. 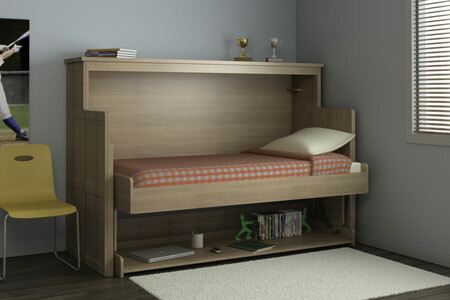 With a 10” or 11” thick mattress a Murphy bed combines space-efficiency and a bed comfortable enough to use every night. This is essential if you’re using the bed in an efficiency apartment or small downtown Columbus, Victorian Village, or a Short North loft. Can be custom designed to fit the décor and size available in your home or apartment – Murphy beds can be designed with complimentary bookshelves (in a home office), entertainment centers (in a studio or loft apartment) or with nightstands in a spare bedroom. They add impact, style and increased function to your home or apartment. Easy to enjoy a smaller space – Home prices and rents have never been higher. This has forced people to own or rent smaller spaces. A wall bed (or fold down bed) frees up space you can enjoy during the day – while it’s simple to bring down your bed to sleep at night. Simple to operate and the bedding stays in place – Murphy beds eliminate the problems of sofa beds which are difficult to open up, you have no place to put the seat cushions and the bedding must be removed to use the couch function. Walls beds save you set up time and transform quickly for sleeping each and every night.